What are the best competitor analysis tools? Run a Google search and you’ll find dozens of posts listing hundreds of different tools, covering every aspect competitive analysis. 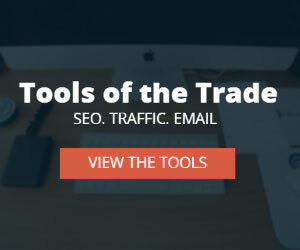 While these lists provide a solid high level overview of all the tools on the market, they often leave feeling totally overwhelmed, not knowing where to start. You’re busy. I'm busy. The fella sitting next to you is busy. Few of us have the time to sit down and manually review a handful, let alone hundreds of different tools. So, instead of creating another monster list, I took a different approach. I wanted to see which tools would rise to the top, and find out if any dominated multiple areas of online competitor researc﻿h. Before we jump into the individual responses, I have compiled all the votes and created a leaderboard for each category of competitor research tools - organic search performance, backlink, content and PPC analysis. Each leaderboard highlights the top two tools with most votes in each category, and includes a high level overview of how the experts use the tools to analyze the competition. SEMrush was unanimously voted as the top tool for analyzing competitor organic search performance. Identify keyword rankings and estimated search volume across 115+ different countries. Use domain vs. domain comparisons to identify keyword and content gaps. Find out which posts/pages are driving the most organic traffic to a website. Filter keyword sets by volume and rankings to quickly identify the low hanging fruit (high traffic potential, with possible quick ranking gains) on a website. Observe keyword ranking and organic search traffic changes to determine if a competitor's SEO strategy is effective or not. Monitor changes in organic visibility and keyword rankings across multiple domains and device types (mobile and desktop). Want to try SEMrush PRO? Ahrefs was not only unanimously voted as the top tool for researching competitor backlinks, ​but was also ranked the top overall tool for link building in this article. Use the competing domain and pages reports to identify unique and common backlink sources. Use the Link Intersect tool to identify sites linking to multiple competitor domains. View the entire backlink profile on one page, and quickly uncover low quality backlinks. Use the "Best by Links" report to find out which content types and topics tend to generate the most backlinks for competitors. Use the Domain Comparison Tool to get a quick snapshot of how multiple domains stack up against each other in terms of the number of referring domains and backlink types (.edu, .gov, .com). Monitor Link Alerts to find out almost immediately when and where a competitor is landing new backlinks. Buzzsumo was a clear favorite for analyzing competitor content. Use the Content Analysis Report to find out which content types and topics generate the most social media engagement across different time frames (24hrs, week, month, year). Find fresh topic ideas by analyzing all the most shared and linked-to content for multiple competitors. Get alerts every time competitors publish new content. Identify all the people engaging with competitor content, and add them to promotional outreach lists. SEMrush was the unanimous winner when it came to analyzing competitor PPC campaigns. Find out how many keywords a competitor is bidding on, how much traffic they get from paid search, and their estimated monthly budget. Identify which keywords a competitor is bidding on, and the cost-per-click for each one. Get a historical view of all the ad copy triggered by each keyword. Ad copy in circulation for consecutive months indicates a potential high converting message. Uncover the landing pages tied to all the competitor's paid keywords and ad copy. Use the Domain vs Domain tool to quickly find PPC keyword gaps - i.e. keywords multiple competitors are bidding on, but you are not. Use the Position Tracking report to see which keywords have been removed from a competitor's PPC campaign (possible low converters), have seen improved ad ranks (high bids? Better quality scores? ), and have been added to the campaign (possible new keyword ideas for your campaign). Want to try SEMrush PRO for both organic and PPC competitor analysis? That was a quick recap of the top tools (along with some of the common use cases) in each category. Below you will not only find out what tools the experts are using, but why they choose them over hundreds of other available solutions on the market. These experts range from in-house SEO managers for global brands all way to agency owners and independent digital marketing consultants. Every one of the people featured in this roundup are in the trenches every day testing and using these competitor analysis tools to help build successful marketing strategies for their businesses and clients. 1. SEMrush - The c﻿﻿apabilities with SEMrush are endless! I use this tool often to pull competitor keyword rankings data, SERP features, and traffic data for competitive analysis. 2. Ahrefs - Ahrefs is ideal because it features important views like its Competing Domains & Pages to analyze unique versus common backlinks. Its ability to filter by country is also valuable for analyzing competitor data for international clients. 3. TagCrowd - TagCrowd is a free, simple tool that I use often to easily find competitor content themes. With TagCrowd you can quickly analyze keyword themes, blog titles, social media posts, and so on to analyze what topics competitors are covering. 4. SEMrush - SEMrush is able to pull paid search keyword and traffic data that's key to analyzing high performing keywords from competitors. Its "Competitors" view is extremely helpful for identifying competing domains with common keywords as well. SEMrush: Organic Research - For organic research I love using SEMrush, their database tracks keyword positions in 115+ countries, tracks your competitors, and how you keyword positions are constantly changing. I use SEMrush for SEO on my site Hammock Town and for all my eCommerce clients. I love it because even the free version gives you actionable insights. For backlink analysis there is no better tool than Ahrefs, though pricing starts at $100 bucks a month, their database is super powerful, fast and easy to use. If you discover one new backlink opportunity every month, which you will, it will easily pay for itself. For content analysis I keep it simple using online readability test tools such as WebPageFX. To communicate effectively with the most of America, your writing should be between 6th-8th grade level. Even publications such as HBR don’t go above junior high reading levels for most of their posts. You can test post publishing or by directly inputting your content in the tool. I just tested an article that should be boring and is typically tough to read “Online S﻿﻿ales Taxes for eCommerce” and the article reads at a 7th grade reading level which is ideal! Post-publish I use Google Analytics to analyze how much traffic and conversion each content piece receives the first 30 days, 60 days and 1 year. SEMrush takes the cake again, for Hammock Town we test a lot of Product Listing Ads in Google Shopping and discovering how much each competitor is bidding on products helps us figure out if we want to compete in that space. Obviously a company like REI has a much bigger budget and we will stay away from keywords and product brands they are typically targeting. SEMrush & Databox - I rely on SEMrush to gain a deep understanding of competitor organic positioning including keywords, rankings and search volume. The Domain vs. Domain tool is great to quickly find the best trends among competitors. With the SEMrush connector in Databox we’re able to monitor the latest search performance data in a simple dashboard to ensure our results stay strong. This daily monitoring allows us to react in real time and makes marketing performance an agile practice versus a daunting month-end project. Moz - Working with clients in highly competitive markets, Moz gives me exactly what I need and it’s painless. Most importantly, I’m able to analyze page and domain authority, link equity (follow vs. no follow), and more. With this competitive intelligence I can set up an action plan for the best opportunities. Screaming Frog & MozBar Premium - To create a content inventory of competitor websites I use Screaming Frog. When I need to take a deeper dive into specific content one page at a time I use MozBar Premium - this gives me insights on their links, content and on-page elements. SEMrush﻿﻿ - We love SEMrush here at Stream Creative, and our clients love the insights and results we achieve. One of my favorite features is the image view of PPC competitor ads. This gives our clients actual competitive data in a format they can easily understand. SEMrush﻿﻿ - SEMrush provides an outstanding array of tools to use when analyzing websites. SEMrush provides a comprehensive overview of each aspect of optimization, and the site audit gives you actionable items you can attack quickly. Ahrefs - I have used several other tools in the past, but Ahrefs has the most comprehensive breakdown of backlinks for quickly understanding your clients as well as top competitors in the industry. Ahrefs also allows you to look at the top competitors in a particular niche, and determine which links they in common. If the top 3 positions in the SERPS have a link from one particular site, this is a link I want to capture for my client. S﻿﻿﻿﻿﻿﻿﻿EMrush﻿﻿﻿﻿﻿﻿﻿ - the SEO content template gives me a great list of semantically related keywords to use in my content. Using a handful of these keywords provides not only semantically related content, but also useful ideas for additional content to add to my page or post. Wordstream is a leader in the field, however, I am not a big fan of the company due to issues with auto billing. SEMrush is a great tool for organic ranking analysis. In other words it’s good for a high-level and also granular view of how an SEO campaign is working when you aren’t focusing on a single aspect (like only links or only social activity). The rankings distribution report, for example, shows progress for targeted keyword phrases as well as estimated traffic volumes and where a domain is ranking for those phrases. You get a snap shot of domains that rank in the top 3, top 10, top, 20 and top 100 for their respective keyword phrases. If you’re dealing with multiple domains it’s very helpful. Ahrefs - To me there is no better link analysis tool on the market than Ahrefs. When you look at a lot of the other mainstream tools, they all do basic metrics like number of links, number of referring domains, anchor text distribution, etc, etc. Ahrefs just has it down to a science. Their only focus is link analysis and how those metrics impact ranking.They keep their index updated on a regular basis; they show every possible metric you can think of when it comes to an inbound link. You can get a complete and detailed picture of an entire backlink profile pretty much in a one page report. The other thing I like about Ahrefs is that they are forward thinking in the development of their tools. They are always innovating, updating, and coming out with new features which is a must in this industry. Some other tools on the market that do link analysis seem to stand still in comparison. Ahrefs top pages tool - The top pages report in Ahrefs is a good way to see what pages are performing well in search as well as which keywords are driving the most traffic. URLs are listed in order of most trafficked and you can see how many keyword phrases the page is ranking for and its corresponding position for each phrase which is convenient. A really cool part of this report is that you can see next to each keyword phrase if Google is featuring the result in an image pack, a featured snippet or some other unique search result. We don’t do a lot of PPC campaign management but SEMrush has a pretty good competitor analysis tool. You can get insight into your competitor’s ad spend and what keywords they are using, you can import their ad copy into the tool and have it all in one spot which helps a ton with generating better ad copy than your competition. Toss-up between SEMrush and Ahrefs. SEMrush has a larger database, but the user interface for Ahrefs is significantly more user friendly. Self-contained: SEMrush, Majestic, and Ahrefs all have strong points. Holistic: LinkResearchTools by a mile! I still haven't found one that I love here. Moz, SEMrush, Ahrefs, BrightEdge, and others provide some interesting insights, though. I believe the platform that manages to tackle semantic value - instead of exact match keyword value - combined with offsite signals (including social and incoming links weighted by originating domain authority) will become the dominant player in this field. SEMrush for organic search performance – SEMrush gives you comprehensive insight into the performance of your competitors in both paid and organic search. The tool gives you a list of all the keywords for which your competitor is ranking, and you can measure the performance of these keywords based on indicators like traffic and search volume. Open Site Explorer (from Moz) for backlink analysis – This easy yet effective tool helps you monitor your competitors’ link-building efforts. Find out which websites are linking to your competitors, and how those websites perform in terms of ranking, and Domain Authority. BuzzSumo for content analysis – BuzzSumo helps you identify the top-performing pieces of content from your competitors, and gives you accurate stats about the number of shares for each post. You can discover the most shared, most popular, and currently trending posts, and keep a close eye on how your competitors’ content is performing. SpyFu for PPC analysis – While SEMrush is an excellent tool for monitoring your competitors’ PPC campaign performance, I would also recommend SpyFu. This tool gives you a list of keywords being targeted by your competitors for their campaigns so you can get a closer look at their strategy. 1) Search Engine Performance - SEMrush is my favorite tool to track and monitor search engine performance. It keeps me up-to-date and well-informed as to how our sites are performing in organic search. 3) Content Analysis - Screaming Frog is my most preferred content analysis tool. It provides all the data I need from both a front-end and technical standpoint. Screaming Frog also makes it so that all data is very digestible and actionable. 4) PPC Analysis - Again, SEMrush for the win. Because most PPC tools are expensive to use, we get great value from using SEMrush for both PPC and SEO. SEMrush - to see how many keywords a site ranks for and the total value of those keywords. In the keyword lists I like filter to see keywords on page 2 (aka near ranking opportunities). Majestic - to have a comprehensive database of links and anchor text. From there I deduct branded vs non-branded anchor %, deep link %, etc. Screaming Frog + URL Profiler - to get a full list of URLs on the site plus many various metrics associated with them. SpyFu - to see an approximation of how much someone is spending on PPC and what keywords they're targeting. SEMrush﻿ - most reliable rankings data, it's easy to use and has a ton of functionality. Ahrefs - most reliable and powerful link index, bar none. SEMr﻿ush - we look at content from an SEO perspective, and SEMrush allows us to see who is performing the best in that given industry. We don't do PPC, but I've heard good things about SpyFu and SEMrush. SEMrush: Great for rank-tracking and includes a presentable dashboard which graphically compares organic performance of competitors in relation to websites you manage. Ahrefs: I'd say this is the most comprehensive backlink analysis tool, but Majestic also uncovers even more footprints. Buzzsumo: Amazing tool for not only analyzing content and its performance in terms of links and social shares, but also for gaining fresh topic ideas from the most popular pieces out there (and their authors). SpyFu: This used to be my secret weapon until it became more widely known! Unrivalled insight into competitor keywords and ads. SEMrush﻿﻿ - When evaluating organic search performance I mostly rely on SEMrush. With its visibility trend, estimated traffic and average position reporting, it makes tracking existing and potential performance a breeze. SEMrush is our go to for evaluating backlinks. Its automated reporting and call out of toxic links really help keep our backlink profiles top of mind. MOZ - For Content Analysis I rely a lot on the MOZ toolset. Specifically the MOZ toolbar. I find it to be a great asset when I need to get a quick pulse on how a site's content is structured on a page by page level. When evaluating a site as a whole, I may instead defer to Screaming Frog as it helps paint a larger picture of what pages need further optimization. Google ﻿﻿﻿Adwords - While I used to use Wordstream quite a bit, I have since moved to relying mostly on a combination of Google Adwords own reporting dashboards mixed with some custom reporting and processes. When setup correctly, Google Adwords can be as effective as most of the 3rd party tools on the market. Great tool to understand the keyword visibility coverage of any competitor. There are some useful features such as the "Domain vs Domain" to understand keyword crossovers. Hands down the best link analysis tool in the market with the freshest data and great UI. The tool is constantly evolving and improving which sets them apart from the others. More than just a link analysis tool. Ahrefs has a Content Explorer tool which is great to find content ideas. If we are doing a content audit on a website, URLprofiler is the go to tool to gather relevant metrics to understand content performance. The PPC section of SEMrush is good to understand what keywords a website are bidding for aggressively but where the goldmine is the "Ad Copies" report where you can get some ideas when writing meta-data for your website. BrightEdge - great for tracking keyword performance, competitor analysis, SEO auditing, and so much more. Ahrefs - can help identify total backlinks, linking domains, and any broken backlinks. A great way to assess for any low quality links or broken links that could be updated. Buzzsumo - useful to asses top performing content & social media shares. Optimizely - really helpful for A/B testing and landing page optimization. 1. Organic search performance: SEMrush, no question about it. Keyword research, competitive analysis, rank tracking, search volume, even takes a stab at filling in keywords not provided. It's all there. 2. Backlink analysis: I prefer Ahrefs over others because of the way it is organized - you can slice and dice the data any way you want and it is all very accessible. I also like the ability to track new and lost links, as well as top performing content for yourself or competitors. They've added a ton of functionality this past year which is always a good sign. 3. Content analysis: I usually measure content performance manually with user engagement (clickstream and social) as well as SEO performance. However, I like BuzzSumo for content research before I begin work on new content just to get the lay of the land. It is always helpful to see what is considered the most successful (links or shares) before diving into it. 4. PPC analysis: Weirdly enough I don't use a specific tool for PPC analysis - I find PPC is sometimes the easiest part of digital marketing because it is very straightforward (math and a rigorous testing framework). However, I do find myself using the paid search data inside SEMrush from time to time. SEMrush & SearchMetrics - Using the data from both tools means I can ensure that any areas of inconsistency are covered and double checked. Occasionally rankings in one may differ from the other and I find it more valuable to get as much insight as possible so that my results are as accurate as can be. Ahrefs - Nothing even comes close to the data that this tool can provide, at least in my opinion. It's very easy to build a detailed view of backlinks and determine where value is being gained and lost. Content analysis is something that, in my opinion, can be measured using tools like Google Analytics and ranking trackers; if Google sees your content as useful to users then rankings tend to improve and if you are attracting the right users to the page then conversion/goals will also increase. I'd rather bring in the users who my content is aimed at and have a higher chance of converting, than bring in hordes of people in the hope that someone buys something. I don't do a lot of PPC work, however I use SEMRush and Google Adwords where needed; both provide reasonably good information on things like volume and bid details. Web console: Great tool to understand ranking & click through rate trends. Can easily segment traffic based on page types, keywords, devices etc. You can also set up a separate profile for your android app and start measuring the app organic performance. MonitorBacklinks - The great thing about this tool is that you get regular updates on new links, broken links or even if someone no followed your existing links. Great too to get these updates regularly via email. Screaming Frog: Screaming frog Using screaming frog to understand the text to html ratio of the pages that are ranking really well on your site. Use this as a benchmark and have a workaround on pages that are low hanging. SpyFu - Great to spy on your competitor strategy. See what keywords they have been consistently bidding over the months. If your competitor is bidding on specific keywords over a longer time indicates those keywords are really working/converting for them. Grab those and make it yours! When using tools I feel that accuracy is the #1 priority. For search engine performance my go to is SEMrush, as well as comparing data in Google Analytics. SEMrush has a reasonable price point as well as being accurate with loads of features and data that is easy to share with my team members. Although strong in search engine performance, SEMrush is lacking in backlink analysis. That’s where Ahrefs comes in. I don't think anything really comes close to Ahrefs in this area. The backlink profile data is very accurate compared to competing tools and is updated frequently. Initially we use Yoast, but then to analyze content performance we dive into Google Analytics. In the future, we will be taking this a step forward by implementing BigQuery to be able to serve our clients content that suits their individual needs. SEMrush offers competitive analysis, helping the user to find the best SEO keywords to get higher rankings. It also allows the user to discover new organic competitors, and observe position changes of domains to see if one’s own tactics are useful or need improvement. Cognitive SEO helps manage and analyze backlinks. It provides the user with information on backlinks, such as anchor text and domain authority of the linking site, with weekly site crawls and filters by source to understand which links are performing better. This allows the user to optimize their website to capture and keep the best performing backlinks. BrightEdge﻿ turns online content into tangible business results such as traffic, revenue, and engagement. It discovers content marketing strategies by identifying successful strategies in your niche. It can audit your content by evaluating current results and recommending focus areas where more engaging content is needed. Wordstream - paid search made easy. You can create, optimize, manage, and measure performance of PPC campaigns in just 20 minutes a week. It analyzes your performance and provides a set of suggested actions. SEMrush - Aside from keyword tracking tools, SEMrush for me is an excellent tool for gaining a quick insight and snapshot into how a domain is performing. It doesn't give you the whole picture but it can help you quickly gauge a campaign. Majestic - Utilizing both the live index and historic index it's really easy to gain insight into a domains backlink status and history. It's far too easy for some webmasters to jump to conclusions about Penguin and link penalties and Majestic can help provide some clarity with great data. Flesch–Kincaid - I don't use any tools per say to analyse content, aside from the Flesch-Kincaid readability scale. Great content is both query and vertical dependent and high quality content answers the question thoroughly. Measuring things like content density and length for me doesn't have any value. AdWords - The raw data of any PPC campaign in either Google AdWords or Bing Ads is the best data for assessing the success of a PPC campaign. Right now, my go-to tool for organic search performance is Advanced Web Ranking (AWR). While tracking organic rankings isn't as useful as it once was due to personalization/localization etc, I still find it helpful. It helps me in terms of tracking competitor visibility & identifying pages that need improvement (when compared to analytical data). For backlink analysis, I use Ahrefs. It's got a huge feature set that spans far beyond simple backlink analysis. One of the main reasons I use it for backlinks is because they've got the largest database of links. Also, I can easily dip into organic search data to find which keywords a specific URL is ranking for. And I can get a list of outgoing links that are broken for any domain. I'm a big fan of the Ahrefs Content Explorer feature right now.I can type in any domain and find their most popular content, and apply a bunch of filters. Thanks to the rich data that Ahrefs has access too, I can also see backlinks, referring domains, anchor text and organic keywords (along with social shares) for each post that comes up. I can also see word counts, authors, publication dates, titles etc - the basic stuff you'd expect. This is pretty helpful data overall and gives me a good idea of what's working in terms of shares & earning links for certain sites. SEMrush is a good tool that offers search engine position tracking and competitive analysis. Ahrefs has one of the largest databases of backlinks and several SEO bloggers have compared it to other alternatives and found it to be a top performer. Scrapebox is a good alternative for people with a smaller budget. Buzzsumo has a feature that will alert you when your favorite authors publish a new article. Social search can discover content that is popular within a time frame you specify. WhatRunsWhere will alert you when your competitors start a new ad campaign and also provide insights to what is working for them and what is not. When it comes to organic search data, KWFinder and SEMrush are my favorite. Both of them use a slightly difference approach for keyword difficulty so I like to compare both when doing keyword research. SEMrush also has very accurate data when it comes to filtering out close variant issues that now plague us due to keyword planner changes. Ahrefs has the most accurate and up to date backlink database out there. I have tried all of them, and none of them pickup new backlinks as fast as Ahrefs. This helps analyze the success of outreach faster and also for cleaning up bad link profiles due to negative SEO. SEMrush allows you to input a competitors URL and see all the keywords it ranks for. Ahrefs has a nice tool called "Content Explorer" which can come in very handy. Buzzsumo is also very nice to see what content is getting shared the most on Twitter, FB, etc. When it comes to PPC analysis, I solely use SEMrush. It provides a great analysis of ads, paid keywords, etc. Semrush - It's great because it has several comprehensive features that allow you to spy anyone that's ranking above you in Google. For example, I use it to see all the keywords that my competitors are ranking for, in Google. Without any doubts, MonitorBacklinks - it's my the go-to tool. As it combines APIs from various other tools, including Moz & Majestic, it's like you are using several tools into just one. SimilarWeb is my tool of choice for analyzing content, and how competitors are performing. SpyFu - just like most tools, they have extended their features, but the PPC one is still the best in the business. SERPwoo: Seeing movement over time, having that history helps assess other competitor's strategies. Especially when you track a bunch of keywords in the same niche, it's a nice way to measure success. Ahrefs: I've never used a backlink analysis tool that comes close to Ahrefs' data. For me it's the best tool for analyzing competition. My brain: If I've isolated a set of keywords for which I'm analyzing content, I use the eye test. Analyzing content and finding what works doesn't have to be complicated; if it's good, it should be identifiable by skimming through it. SEMrush: here I can get actual data who's bidding for the keywords I want and where competitor's are that I'm not. Having the banner ads compiled cuts down time spent finding them on my own. There's a reason why SEMrush is the software tool of choice for many professional SEOs - it's awesome, plain and simple. Super flexible and super powerful, SEMrush can handle just about any task you throw at it, from in-depth keyword research to comprehensive website audits, SEMrush has a plethora of powerful features to give you the competitive edge. In my opinion, nothing compares to the power of Ahrefs when it comes to competitor link analysis. In almost every SEO campaign I've ever managed Ahrefs has uncovered more genuine link opportunities than Majestic SEO, SEO Spyglass and Raven Tools. But it's not the sheer volume of information that Ahrefs uncovers - it's how that vast amount of data is presented that makes it a clear winner for me. When it comes to content analysis I never rely exclusively on a particular tool as I find it encourages you to adopt a "paint by numbers" approach to content creation. It's easy to fall into the trap of including keywords and adding images purely to achieve a "great" SEO score, and that's something I'm always keen to avoid. That said, if you're relatively inexperienced with SEO and you have a WordPress website, the Yoast SEO plugin is still absolutely essential - if only to eliminate the many inherent duplicate content issues the platform has. I've only recently started using SpyFu, and I like it. A lot. It has a few features that many competing products lack, and the interface is pretty slick and intuitive and helps to simplify PPC campaign management. I use a combination of tools. Both SEMrush and Ahrefs have a ton of functionality and I like checking both to see what keywords we (and competitors) are ranking for that I may not be actively tracking. We also use these for rank tracking for keywords we are actively tracking.From a local ranking perspective, Places Scout is a great tool for, again, both tracking your own performance and competitive research. Ahrefs is good for backlink analysis, but I typically opt for Majestic. Maybe it’s just because I’ve been using it forever and am used to it. But I’m also a big fan of their topic analysis, so you can see not only quantity and quality of links, but also what type of industry/content the links are coming from. I’m a huge fan of Screaming Frog for getting a lot of data at once. In terms of analyzing single pages of content, nothing beats a good old manual look-through (and maybe a couple odd tools for keyword counts and that type of thing). 1) For competitive search analysis & rank tracking, we use Ahrefs, a powerful tool for identifying gaps in keyword strategies, based on competitor insights. We also love that they provide SERP details for specific keywords. This feature can help inform content-type strategies. We also use Google Search Console for CTR-optimization discovery. 2) Ahrefs is our go-to tool for backlink analysis. It's good for tracking new/lost backlinks, broken/incorrect backlinks (which is crucial for a link reclamation strategy!) as well as a full view of your competitor's backlink profile. This is an awesome feature for uncovering backlink opportunities. 3) Again, Ahref offers actionable insights with their Content Gap Analysis tool: What queries are your competitors ranking for that you're not ranking for? How can you create BETTER content to be able to compete for page 1 rankings? 4) SuperScript currently does not offer PPC analysis to clients. We consult with our clients' in-house PPC teams to align on both paid and organic search efforts. Authority Labs - Hard to pick just one tool here, as there are so many good ones. But AL does a great job with rank tracking, is easy to use, and has a nice grouping feature for tracking multiple websites and competitors. Majestic - Huge index, easy to understand both quality and quantity in a backlink profile, and great for reverse-engineering competitor link building strategies. Screaming Frog - Provides excellent detail on missing / malformed / too long or short meta tags, thin content pages, missing H1 tags, and more. SEMrush - The best tool for understanding keyword potential and competitor PPC strategies. SEO Monitor: it's great at integrating Google Search Console keyword data into SEO reporting and makes finding new keyword opportunities easy. It's also ace at forecasting SEO projects and if you work for an SEO agency, it can be fantastic for SEO pitches. Ahrefs: this was a close call with Majestic but I find the user experience better and both have a superior backlink database compared to Open Site Explorer. Buzzsumo: absolutely love this tool when it comes to researching content marketing strategies for competitors. I also use it to stay up-to-date with the SEO and content marketing stories and news. SEMRush: great for all things keyword related and lots more. If you have the Guru subscription, it even pulls out historical data which can be awesome for PPC analysis. It’s a powerful tool for checking your website's performance. Pretty quick and in-depth in determining which of your keywords are performing well on the rankings. My go-to-tool for checking the backlinks of my websites, as well as my competitors. It gives me a clear pictureon which of my links are good in the eyes of Google as well as giving me ideas on which links I can make basingfrom competition. What a lot of people (including myself) consider to be the best content analysis tool out there. Buzzsumo gives you themost shared articles of a certain topic and see what's trending on the internet. Going back to SEMrush, you can create and manage your PPC campaigns in a numberways such as filtering your keyword's CPCs and search volume. It also allows you to export your organized reportsso that you can use them on Google Adwords. Pretty much saves everybody's time by lessening the effort. Arguably the largest Content Delivery Network provider and I personally consider it to be the best CDN provider out there. My sites have been loading really fast because all my static files (CSS, JS, Images, etc.) are loaded from the nearest geographic CDN location. Site speed plays an crucial role in ranking websites. If you’re always having problems with your load speed, this is definitely the tool for you. 1. Ahrefs - I find the dashboard really intuitive so I can find what I need quickly. 2. Ahrefs - it has the largest and most accurate link database, so I trust it. 3. Ahrefs - it's easy to see top content pages on any site. 4. Ahrefs - again, the data is really accurate and you can find all the stats you need very easily. I also use Google webmaster console, SEMrush and KW Finder - but Ahrefs is the one I trust most and keep going back to for practically everything, as does my business partner in our SEO business. Organic Search Performance: Google Analytics & SEMrush. I find using data from SEMRush for organic visibility and aligning it with GA traffic data provides powerful insights that are highly actionable. Backlink Analysis: Moz Open Site Explorer & Ahrefs. Although Moz is great, it lacks data for varied market regions. This is where Ahrefs comes handy with more information on backlinks and toxicity. Content Analysis: ScreamingFrog & URLProfiler. A full content audit can be carried out with these tools. For outreach however, Buzzsumo and Buzzsstream are really useful. PPC Analysis: SEMRush & Google Adwords. Ahrefs / SEMrush. SEOs have never had it so good for options to measure performance. In terms of how an individual site is performing, analytics data is of course the main barometer, mixed in with Google Search Console's Search Analytics reporting. But in terms of a tool to measure what you are visible for, Ahrefs and SEMrush are my current go-to options. Both provide different types of actionable data, so I often end up using both in a campaign, but the quick access to a site's success is the main draw. You can also get similar information from Sistrix and Searchmetrics. SEOMonitor and SERPWoo are a different style but also should be mentioned. On the more enterprise end of the scale, I've also heard strong things about STAT and Pi Datametrics and hope to try them out fully in the near future. Majestic / Ahrefs. They each have their strengths, but if you use either Majestic or Ahrefs you can get a good picture of your backlink profile and analyse the competition. Both will give you plenty of fuel for your campaign. An extra mention should go to Majestic's free data for webmasters, a great way to introduce small businesses to links. You brain! You can use tools such as Moz Pro On-Page Grader to measure optimisation performance, and SEMrush/Ahrefs/Sistrix to see what topics a page ranks for, but they don't analyse the content itself, so often this is a manual task. For self-analysis, building a content inventory, based on a crawl of the site (so using the SEO Spider from Screaming Frog naturally...), is usually the starting point. For analysing competitor content, the best automated starting point is keyword difficulty tools that measure use of the core topic in on-page elements etc. But with the rise of semantic understanding, the need for E-A-T content and so on, this is less helpful for content analysis. Searchmetrics' Content Experience looks an interesting entry into the field, using deep learning and an agile attitude to guiding your content improvements. I expect to see a lot more tools aim to help you understand search intent in this way. SEMrush / SpyFu. Both of these can give you an immediate snapshot of what a campaign is bidding on, what the ads copy is like and so on. Of course, in experienced hands, manual analysis of a campaign within AdWords for example is still the strongest. If you are looking more for management, then Wordstream is excellent, and their free tools also offer some good analysis to kick off a campaign. Ahrefs is great for more than just backlink analysis - it’s also my go to tool for organic search competitive analysis. It provides info on top performing keywords as well as top performing pages. Additional features such as Content Explorer and the Content Gap report make it a must use tool. Ahrefs is far and away the best tool for link analysis because it crawls deeper than most other tools and on average returns two times the number of off page references for a site. In short, it’s one of the most powerful SEO tools available. URL﻿﻿ Profiler does so much for one tool. It provides a ton of data on content topics, duplicate content, readability, sentiment, Google Analytics data, Google Search Console data, social shares, and more. It’s truly the only tool you need for an in-depth content analysis and audit. Follow provides a wide range of paid media intelligence such as top keywords and ads, top placements and networks, alongside visual examples of image ads and text ads. The tool also pulls data on everything from affiliate marketing campaigns to site demographics. The best feature is the Chrome extension making it easy to see competitive data on any site as you’re browsing. 1) Organic search performance - AWR Cloud: I track all my keyword rankings using Advanced Web Ranking and it's proven to be a great tool. Easy to use, accurate and just plain works. Boom. 2) Backlink analysis - SEMrush: I like to check out the content my competitors publish and see where they're winning links from so I can get some of my own. SEMrush makes this super simple, and their export function allows me to play with the data as much as I want. Awesome. 3) Content analysis - BuzzSumo: Seeing what kind of content has been performing well over the past week, month or year is essential in predicting what kind of content will attract traffic in the future. BuzzSumo does just this, and gives me other essential social and traffic data as well to inform our content decisions. Very slick. 4) PPC analysis - WordStream: PPC is really hard to get right because you have to be really efficient with your spend. WordStream analyzes how far my dollars are going and then goes above and beyond by recommending what changes I need to make to improve my performance. Love it. 1) SEMrush: I honestly don't spend a ton of time trying to nail down which competitors are getting how much traffic as I find a lot of the estimations there can be pretty far off, but I'm in SEMrush a ton anyway (as my other answers will prove :)) so if I want to get a quick sense of traffic gains / drops, I'll typically use SEMrush. 2) Ahrefs is my go-to for backlink analysis - I find it's the best balance of being comprehensive and also helping me quickly sift through data and surface the most important (either in terms of links that are helping or links that are hurting) insights. 3) SEMrush is probably my top choice here as I find it does the best job of unearthing non-obvious terms that are driving traffic for competitors / publishing sites. BuzzSumo is also great for quickly finding the most shared content for a competitor / in a niche. 4) SEMrush is typically my go-to here as it does a nice job of showing the terms that have the most share of traffic and also allows me to quickly look at ad copy. SpyFu also has great tools here, and as with everything just going and looking at the old-fashioned search results is another key step for me in better understanding what competitors are doing on key search results. This tool helps me understand my ranking signals and my competition to find opportunities. Backlink Analysis - SEMrush: Easy way to find my backlink profile. I can also use SEMrush to find backlinks my competition uses to gain additional value in the market. Content Analysis - Article Insights: This is like a search engine on steroids when it comes to finding new content to source and reference. PPC Analysis - SEMrush: The Advertising Analysis tool lets me see ad copy, keywords and phrasing at a glance. Great resource to begin competitive PPC analysis projects for myself, clients, or on the competition. For organic search performance, I tend to lean towards Search Console, as it allows me to look at exactly what Google is providing me for ranking keywords & phrases. Not only that it gives me an idea of what pages I can target for improvement, as well as some of the technical issues that may surface. If I see a page is ranking top 4-5 for a variety of med-high volume search phrases, but that page has a relatively low CTR, I can tell right then this page is a pain point. Backlink analysis tool(s). First I always look at ahrefs.com, as that allows me to monitor not just what backlinks our clients are receiving and losing recently, but I can also monitor what their competitors are doing for backlinks. In terms of deeper analysis, I will go back to Search Console, and download a .csv and comb through the backlinks manually. We do this regularly for all of our clients, because we are seeing a lot more malicious backlinks surfacing in client’s backlink profiles that require swift action taken. For content analysis, I prefer to use Google Analytics primarily. I like to track the common metrics, and collective user behavior for pages. From there, I like to take note of pages that may be under performing or exceeding expectations, so that we can either adjust or implement similar methods for future content. At CF Search Marketing, we have our own proprietary software, Dealer Ad Spy, which we use for PPC competitive analysis. We use our own tool because our clients are very dependent upon being able to target a very specific area, and provide a detailed “backyard analysis”. 1. SEMrush: Love their dashboard. Great for getting a snapshot of a companies SEO profile and it's easy to convert to PDFs for clients. 2. Moz: The Moz One Site Explorer tool is great for uncovering backlink opportunities with your industry. Also, their Chrome Extensions is helpful for a summary of a site's backlink profile. 3. Buzzsumo: If you want to write epic content that's best in class then you need to start with Buzzsumo. It shows the most shared content based on keywords so you know what you're up against. 4. Keyword Planner: I still love doing keyword searches with the Adwords planner tool. It's free and it shows the two things you really need: search demand and price. 1. A﻿href﻿s - They have really stepped it up lately with new features. For organic search performance, I love the fact that they will show you (or your competitors) all the phrases you rank for. I'm always surprised by what I find. Another great feature is their SERPs analyzer that shows you how the top 10 results stack up against your site. 2. Ahrefs - It's my go-to for identifying not only who is linking to my sites, but also for opportunities to build links. From broken backlinks to sites linking to competitors, It's easy to find targets to reach out to. 3. Ahrefs - I know most will probably point to Buzzsumo, but I'm already paying for Ahrefs and their Content Explorer can definitely get the job done. From your search results you can see social shares and even who tweeted the content. Best of all, you can export all of the data to create an action plan around. 4. SEMrush﻿ - While I wanted to put Ahrefs here, I don't think there is too much debate that SEMrush is one of the premier services for PPC analysis. There's really not much you can't do with it. With SEMrush it is a breeze to source your competitor's keywords and data associated with them to build out your paid search strategy. Google’s Search Console is every bit as essential as Google Analytics and yet many people don’t use it. I regularly work in Search Console to assess health of my sites, monitoring the index and how it’s crawled. Ahrefs is still my favorite tool for analyzing backlinks, their index is massive and very quick to discover new links. My favorite tool for analyzing content is Buzzsumo. This tool allows you to see the most shared content around your chosen keyword or you can plug in a competitor’s site and see their top pages/articles. Even a free account allows you to do a lot, really underrated tool. One of the first tools I used when working in PPC was SpyFu, it’s something I still find really effective. You’re never going to get on-the-money analysis of how much your competitors spend without access to their account, but SpyFu’s estimations do an admirable job. I mostly use it for quick snapshots of what keywords my competitors are using to quickly build new campaigns. 1) Ahrefs: their keyword explorer tool kicks *ss for real. 2) Ahrefs: the king of analyzing backlinks. Enough said. 1) Serpstat I am using the tool mainly because it's very affordable and has a lot of tools to play with under one roof. They will show you which keywords you and your competitors rank for, how you compare to your competitors and which phrases specifically you need to target to rank for a wider range of queries. There's also a neat on-page diagnostics tool inside to address some of your site-specific SEO issues. 2) Majestic SEO is pretty much all I use for backlink research, both for my site and my competitors. It helps in many areas including spotting new links, doing broken link building, PR and more. 3) BuzzSumo is my favorite tool when it comes to content and influencer marketing research. I love the ability to search by author name. My favorite feature is content alerts sending you handy emails of your web mentions or new content on any topic. 4) Spyfu is the only tool I use for PPC research. It's an awesome tool to analyze your competitors' PPC tactics, estimate budgets, etc. 1) We primarily use SEMrush and Google Analytics to create a broad organic visibility. We have a proprietary tool built off of Keen for granular reporting. 2) We uses Ahrefs and Open Site Explorer for the heavy lifting on link maintenance. I’ve filtered through SEMRush, Moz, Spyfu, and Advanced Web Rankings in the last few years and I think it comes down to Moz and SEMrush. I love the AWR interface the absolute best but hate their lack of local search volumes. I get the most use out of SEMRush on the daily; but trust the Moz brand the most. Wish there was a way to Frankenstein them into one monster as I feel they each fulfill most of my needs and yet fall short of the complete package. Final Answer: Moz. I have yet to experience the pleasures of AHREFS on a consistent basis (although I hear nothing but good) so I have to go with what I’ve used which is Moz OSE and Majestic. Of the two, Majestic is perfectly fine and functional and was there for me early on, but I definitely prefer Moz. Final answer: Moz. I analyze the effectiveness of my content in Google analytics, webmaster tools, my SEO software, and my brain. The primary elements are focus keywords rank changes, CTR for effectiveness of the meta description and title tag, bounce rate, session duration and pages for how engaging the content is and whether it draws them further into the site, and impressions for how often it shows up in search. Final answer: Google Analytics. There is no better tool than data mining your analytics. That said, SpyFu is a good tool here for some insight on both your own campaigns and the competition. WhatRunsWhere is powerful but goes way beyond my typical AdWords needs. But other than Google Analytics, SEMRush wins for ease of use, insights, and interface. Final answer: SEMrush. 1) Search Engine Performance - Since everyone sees different results, we use a combination of tools including isearchfrom.com, Brightlocal's search tool, micrositemasters﻿﻿﻿.com, SEMrush, and of course live searches. 3) Content analysis - I like the content tools on Ahrefs and Greenlane has a neat outdated content finder too﻿﻿l. And you can do some analysis with Screaming Frog as well. 4) PPC Analysis - Of course the AdWords tools like the ad preview tool, but we also use SEMrush (mostly), and isearchfrom.com for local/small competitors. 4) Optmyzr for PPC analysis. I love using Similar Web and Ahrefs for competitive analysis. Similar Web gives me an idea of where competitor traffic comes from so I can see where their money is spent (or not spent), and Ahrefs allows me to dig a little deeper and show me which keywords that traffic comes from. I find this process invaluable to analyse Search Engine and PPC performance. When it comes to backlinks, Ahrefs has you covered, too. Content Analysis then is a completely different beast as content spans not only competitor websites, but their social presences and external mentions in forms of press coverage, guest posts etc as well. Screaming Frog is great to get a general overview of what's on the website, and from then it's manual digging for me. I use Ahrefs for the first three. Not only does Ahrefs have the biggest link index (making it the best backlink analysis tool out there, in my opinion), but you can also track rankings for your websites on the dashboard. Their "Content Explorer" is great for content analysis, although Buzzsumo is also good! PPC analysis isn't something I do much of but if I did, I'd probably use SEMrush. #58. Sergey Grybniak | Clever Solution Inc.
Organic Search Performance: Ahrefs, SimilarWeb, SEMrush. There are many tools to analyze organic search performance, but I prefer Ahrefs as it allows getting access to all the keywords a competitor’s site ranks for in search, to their search volume and organic traffic per keyword. It is also great to research keywords in Google’s top. Other pretty useful tools are SimilarWeb and SEMrush. Use these to analyze and measure competitors’ traffic and traffic sources. They will help you discover new competitors as well. Bonus: SEMrush provides tons of important info about paid traffic, social media and content as well. As Ahrefs, it can be your silver bullet solution. Ahrefs is perfect to get a nice and clear picture of backlinks your competitors have. Just access “Site Explorer” tab, insert the URL of the site you want to explore, and here you have it — a detailed Backlink profile of your competitor, including DA, PA, internal and external backlinks and so on. Majestic SEO and Moz’s Open Site Explorer are viable alternatives too. If you enjoy analyzing backlinks, there two are a worthy pick. I, personally, have an account at Majestic SEO and regularly compare its data with Ahrefs. This process can make a huge difference. I prefer using Ahrefs to analyze content, yet sometimes I rely on Buzzsumo too. Ahrefs features a wonderful “Content Explorer” tab that allows you to find the most shared content for any topic or research content on your competitor sites. I use Buzzsumo mostly to compare social data with Ahrefs. This one is tricky. The thing is, Google AdWords Keyword Planner used to have a specific tab where you could easily analyze your competitors’ campaigns. All other tools used the data from that tab. Unfortunately, Google closed access to it. So far, I use Ahrefs but I take into account that its data may be inaccurate. Basically, you need to run a manual analysis here. 1) WebCEO - WebCEO has an outstanding keyword rank tracker as well as an unmatched SEO and Social Media monitoring dashboard. You are able to track a keyword for any desired location across all available search engines across the internet. Also, you can track your competitors' content, social media strategy, and backlinking strategy for any specific keyword. You can also create full SEO technical audits with its technical SEO tools. It's much more comprehensive than the other SEO tools that I've used. 2) SEMrush - For backlinks, SEMrush provides a detailed list of all competitor backlinks (follow and no-follow). It also includes competitor backlinks that other similar tools have not managed to grab. 3) BuzzSumo - BuzzSumo provides a list of top articles and influencers related to any keyword that you search for. For finding higher-quality content topics to write about, this is extremely helpful. 4) SpyFu - SpyFu allows you to see all of your competitors' PPC ads during any given past period. You can also see all of your competitors' paid keywords and total PPC spend per month. I haven't yet found another PPC research tool that is as comprehensive. Organic search performance - SEMrush - normally, I'd suggest Google Analytics because it's free and it's made by none other than Google itself. Still, SEMrush has a simpler, more user-friendly interface that I like. It also presents a lot of data more intuitively. I like the fact that I have access to other actionable info such as a report on organic competitors and their best keywords. Backlink analysis - Ahrefs - We've been using Ahrefs for some time and it's one of the most comprehensive backlink analysis tools we've come across (and we've tried several). Content analysis - Yoast - Yoast has a free,web-based content analysis tool and also a plug-in. We have both and it's really quick and easy to use. No complicated bells and whistles or long load times. PPC analysis - Google Analytics - For this, I'd say just stick with the original provider. Search Engine Performance - SEMrush I absolutely love their reports. They have a nice way of presenting data. Backlink Analysis - Ahrefs. They have a huge index of backlinks! That plus their SEO metrics makes it easy to quickly get a handle on the overall picture. Content Analysis - CanIRank. Among other things, I use it every time I publish a new post. It compares my post to the top search results and provides advice on what optimizations will help me most. PPC Analysis - Back when I was running PPC in the automotive field I relied mostly on Google's suite of tools. Search Engine Performance - Ranktrackr - The rankings seem to be pretty accurate and the interface is easy to use. Backlink analysis - S﻿﻿EOJet - (Shameless self promotion here) Most people like to look at number of backlinks of their competitors but I find it more useful to look at what the anchor text profile looks like. SEOJet quickly shows you how it stacks up to #1 ranked sites. Content Analysis - I don't really have a tool I use for content analysis. This I do more manually using a site like WordCounter to get a grip on what length of article I will need to write to compete. PPC Analysis - SpyFu - Whenever I want to find what key phrases my competitors are bidding on I use SpyFu. They have in depth reporting on keywords, ads and how often those ads run. Backlink analysis: Open Site Explorer via Moz. Content analysis: No tools, just look at their website. 1) SEMrush - For me it’s great at finding what keywords you are ranking and where you can improve. It great for quick competitors organic traffic insights. 2) Ahrefs - My favorite tool for backlink analysis that also measures quality, anchor text profiles. It’s also good for content and referral traffic insights. 3) BuzzSumo – I love this tool, it gives you a quick snapshot of the best preforming content. It can uncover potential influencers and it’s great for additional back-link analysis. 4) iSpionage is a pretty cool tool that lets you track your competitors PPC campaigns. Also good for keyword research and specific keyword tracking. SEMrush is my go-to tools when it comes to analyzing the organic search strategies of my top competitors. - Organic Search Positions report: find out all the keywords driving traffic traffic to competitor websites. Plus, identify all the low hanging fruit on personal and client websites. - Organic Top Pages report: find out which pages/post on a competitor's site are driving the most organic search traffic. - Keyword distribution: monitor the number of keywords competitor's are ranking in the top 3, 10 etc positions, and analyze the trends over time. I also really like their new "keyword magic" tool for expanding on seed keyword lists. When it comes to analyzing backlink profiles, nothing comes close to Ahrefs. The tool has the a monster index that is constantly updated, and the UI is amazing. I use URL Profiler for all my client content audits to pull data from Screaming Frog, Google Analytics, Search Console and Ahrefs, and map it back to the page-level across sites of all sizes. This tool saves me hours of time, and allows me to make strategic decisions about whether to keep, merge, consolidate, improve or remove content from websites, at scale. I also like to use Buzzsumo to see which content generates the most engagement across certain topics and industries. Again, SEMrush destroys the competition. I use the tool to find out what keywords my competitors are using to drive traffic, the ad copy they are using to win the click, and the landing pages used to convert the traffic. I can also track all this data historically to get data-driven insights into what is and is not working. This saves my clients time, and a lot of money in wasted ad spend. It helps eliminate the guesswork right from the beginning. My go to tool to use here is the Moz Rankings checker. Bynder is a global company, and so I have SEO campaigns for each country we are targeting. Moz allows me to easily separate out our keyword ranking for each country and see how we are ranking against our competitors for that particular country. It also gives me a clear graph on past ranking performance for each keyword and so progress we have made against our competitors. I think that backlink analysis is quite a difficult one to get right, as the web is so vast it can be difficult to accurately report every backlink that you or your competitors have. However I think Majestic SEO does quite a thorough job, and so is the one I rely on the most. I also think that the way that they present their data is very easy to understand, which means I can just send the Majestic graphs to my manager without needing to change them or use backlink data to make my own graphs. My tool of choice here is DeepCrawl. The crawl report is displayed in a very easy to understand format and requires little to no data manipulation in order to gain actionable insights. This means that if my competitors are doing something cool (or not so cool) with their internal link structure or general site architecture, I know about it as quickly as possible. I do not manage the PPC at Bynder, this is done by my colleague David Mirshahi: Google Adwords is the tool I use the most for competitor analysis as it allows me to see the average position of my ads. Apart from that I feel that there is a lack of quality tools out there for PPC competitor analysis, and that someone with the right product could really make an impact. What new tools are you going to use for competitor research? A big thanks to all the experts who took the time to contribute to this roundup. Please share if you enjoyed the insights! Which tools are you using to analyze your online competitors? Thanks Dennis! Yes – I use Ahrefs and SEMrush pretty much every day. More SEMrush for organic research, and Ahrefs for content and backlink analysis. Nice detailed post Robbie. I can personally say that Ahrefs is really great – which is reflected in your post as well. We’ve found it to be a comprehensive SEO analysis tool because it has features to analyse content, on page factors, and backlinks of-course , in a detailed manner. So if you don’t want to spend on multiple tools, this could be worth a look. Thanks Umesh! Yes – I agree that Ahrefs is an awesome tool, and one that seems to get better every single day. I personally use it most days for personal and client SEO work. Great post and analysis Robbie. I (with some admitted bias) have an SEO platform with competitive analysis capabilities to add to your list. gShift is an enterprise level SEO and content performance platform for Agencies and Brands, which incorporates keyword research, keyword rank data (National, Local and Mobile), social signals, Google Analytics and Search Console integration, custom dashboarding, configurable white-label reports, backlinks (via Majestic SEO) and activity management. Learn more at http://gshift.it/zykucsn. Thanks for sharing, Jeff! I’ll have to check it out. I use a lot of different ones until I can find one that seems to work the best for me. But until then I use SECockpit, SEMRush, MOZ, SEOProfiler, SEO Power Suite, LongtailPro and Jaaxy. These are all for keyword Research. I also use Google Analytics and Google Search Console. I don’t do any backlinks yet I’m still trying to get my websites to rank at least on Page 1. The site i have been focusing on is an authority wannabe site. It’s hard to make progress as an authority site when first starting out because I don’t have much in the way of authority yet because my site is 9 months old. We are going to add a small store where we will offer mostly affiliate products and hopefully the sales will be successful and help it to rank high on page 1! It’s in the Dog niche and that is quite competitive. However, I plan on sticking it out and hopefully, eventually it will payoff. I also need to make a decision on tools and narrow down all those tools–too expensitve! Wow Barbara, that’s a lot of tools 🙂 I think you could get away with consolidating down to just SEMrush and/or Ahrefs and you’ll be set. For me it is hands down AHREFS. I like SEMRush for traffic analysis. Really appreciate the time and effort that has gone into this post. Thanks Robbie for putting all this together, looking forward to more of your quality content. I personally prefer semrush and alexa. Semrush is a way better for keyword research. I love ahrefs for backlink analysis. These two are my favorites. Agreed, semrush is the superior keyword research tool, but Ahrefs is outstanding for backlinks and competitor analysis.